Typhoo have kindly given me a years supply of Typhoo Tea to give to one very lucky winner. 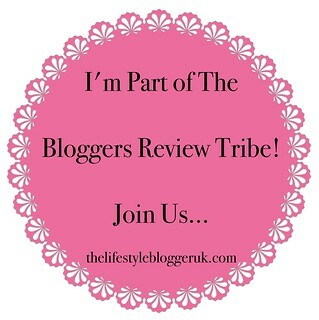 Why not check out their website at http://www.typhootea.co.uk/. 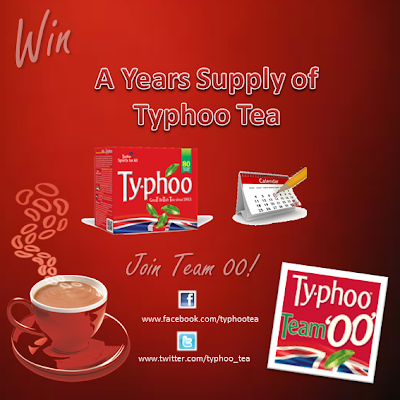 You can become a fan on Facebook at http://www.facebook.com/typhootea and follow them on Twitter http://www.twitter.com/typhoo_tea. Entry is via the Rafflecopter form below. The competition will be running from 1.30pm on 1st October 2012 until 4am on 31st October 2012. It is open to UK residents only, aged 18 years and over (you will be required to declare your date of birth in order to claim your prize). Winners will be drawn at random on 1st November 2012 from all valid entries. milk in last, no sugar, steamin hot! I make my tea in a mug. Bag in, top with boiling water, splash of milk. It's strong enough when the spoon stands up!! I use a teapot to brew my perfect cup of Typhoo tea. Then i add to my cup a little milk, a little sugar, pour the tea and then sit down and relax. When I get to keep my tea and its not stolen by my two year old, I like a milky tea with one sugar with a nice rich tea biscuit with butter on it lush! I like it strong with not too much milk and no sugar. Perfect first thing in the morning. Milk and lots of sugar! In a warmed tea pot, milk and no sugar, and milk in first! milk first, and lots of it ! We pour the water in as soon as the kettle clicks from the boil, Hubby is convinced it makes a difference. Water, tea bag, wait, bag out, milk. Heat the pot, freshly boiled water, allow to brew. Milk in first, then the tea. soya milk medium brew and sweetner - ah perfect! In a pot - leave to mash for 7 minutes! Leave teh tea bag in for ages to make it really strong that just add milk! Lovely strong tea for me i have to have a cup no matter where i am its my fave drink. Tea bag in for 2 minutes then add milk, definitely no sugar. I like it strong with a little milk and no sugar. Boil the kettle, when boiled pour an amount into the teapot to warm, tip out add teabag (or tea if its Sunday morning :)) usually two/three bags, then pour in the boiling water & let it steep for three minutes, put the milk into the cups & then pour in the tea, open your favourite packet of biscuits to dunk, then sit back & enjoy. Let it brew, no sugar and don't add too much milk! I love it strong or weak, we have got through so many kettles over the years as we wear them out keeping brewing up! Typhoo teg bag, hot water, half a teaspoon of sugar and a little milk. My mum trained me up well. Leave the tea bag in for at least a couple of minutes, but not too long for it to get stewed. Stir a couple of times, squeeze bag a few times, remove bag, stir again, add sugar and then milk. I always use fresh water, I can't stand tea made with water thats been boiled more than once. teabag, boiling water, a couple of minute to steep adn tis done - no milk or sugar for me! I like my tea not too strong so I put the milk in first with the tea bag, add the water, dip it about a bit and remove the teabag when it's just the colour i like. Warm teapot first so that the tea stays hotter for longer. Put fresh water in the kettle to boil. Empty teapot, put teabags in, pour on freshley boiled water and cover with teacosy. Leave a few mins then pour out tea and add a dash of milk. Make it in my favourite mug, add milk first, then brew till its the perfect colour. Typhoo tea bag boiling water and stronger the better lovely! I like a fresh, hot brew, with only milk added, ahh lovely Typhoo. by getting my husband to make it! tea bag, then add the water, remove the bag then add the milk - simple! I like it strong with just a splash of milk and no sugar, tea that tastes like tea mot milky water! Love a strong cuppa with drop of milk! Tea bag in a pot for one, pour & add milk. One teabag in a small teapot, hot water, brew for less than a minute, don't want it too strong,pour into cups and add a dash of milk, swish the spoon and a perfect cuppa! Best made in a teapot and left to brew for a couple of minutes. I love my tea on toast and not in a cup! strong but quite milky & def no sugar!!! fresh water in kettle, heat teapot with boiling water then leave tea bags on water for 5 mins or so, pour and add milk. No sugar. Medium strength and milk in last! With milk and one sugar. Tea bag in a cup, 2/3 sugars, boiling hot water, let it brew for a few mins, then squeeze the tea bag out and then give it a drop of milk so its a caramel-ish colour. Perfect! My huge pink mug, milk and one sweetener! i let it brew so it's nice and strong then i add 2 spoons of sugar and just the tiniest splash of semi skimmed milk to my china cup. lovely!!! Tea Bag in, freshly boiled water and milk in last. Then stir like mad ! It has to made in a teapot , warmed first and freshly boiled water. Tea Bag in, add nice steaming water, give it a swirl and a dash of milk and off I go ...refreshing and delicious it keeps me going throughout the day! teabag in mug, boiling water, bag out after 2 mins, splash of goats milk in. We had this discussion in work last week, I say put the milk in first then tea from a pot. Boiling water, hot mug, and patience. Tea bag in cup, pour over freshly boiled water and leave to brew for a few minutes, remove tea bag and add skimmed milk. Milk, typhoo tea bag and 2 sugars in the cup first, then hot water. stir 5 times and voila! Water just from the boil, let it brew a minute or so and then add a good drop of milk. Loose tea in boiling water in tea-pot, standing for 3 minutes and adding milk in tea-cup. i make my cup of tea by putting the tea bag into my mug, add boiling water, let it brew for couple of minutes, then i will add the milk. Rinse out the kettle & fill with fresh filtered water. I like tea black so just have the bag in the cup, pour the water on, agitate it with a spoon briefly then remove the bag. The other half prefers a teapot though so if he's having some too that's how we have it!